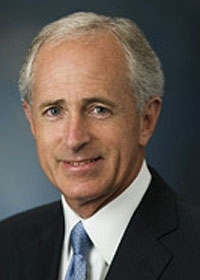 U.S. Sen. Bob Corker, R-Tenn., says he doesn't see a contradiction between his past support of General Motors and his recent opposition in Congress to federal loans for the troubled Detroit 3 automakers. Corker emerged as a harsh critic of GM and the UAW during Congressional debate over the bailout last year. GM is spiraling downward, said the freshman senator in November. But Corker was once an enthusiastic proponent of GM -- or sure sounded like it. A video circulating on YouTube shows just how enthusiastic he was. During the bailout debate, Corker tried to fashion a compromise that would have approved initial loans for the Detroit 3 through the Senate on the night of Dec. 11. That proposal called for the UAW, at some point in 2009, to accept wages and benefits competitive with the transplants. UAW President Ron Gettelfinger would not agree to let the concessions take effect in 2009. Corker, in an interview with Automotive News on Wednesday, defended his positions on GM and the bailout. make sure that you work on putting in place policies that cause companies like this to thrive."